US-based Medtronic has entered into a definitive agreement to acquire Ireland-based Covidien for approximately $42.9bn in cash and stock. Pursuant to the terms of the agreement, Medtronic will acquire Covidien in a cash-and-stock transaction valued at $93.22 per Covidien share. This transaction has been approved by the boards of directors of Medtronic and Covidien. Subject to certain conditions and regulatory clearances in the US, EU, China and certain other countries, the transaction is expected to close in the fourth calendar quarter of 2014 or early 2015. Medtronic claims that the company will have significantly advanced its position as the world’s premier medical technology and services company once the transaction is completed. According to Medtronic, the combined company will have a comprehensive product portfolio, a diversified growth profile and broad geographic reach, with 87,000 employees in more than 150 countries. The combination with Covidien supports and accelerates Medtronic’s three fundamental strategies, including, therapy innovation, globalization, and economic value. Medtronic chairman and CEO Omar Ishrak said that the company is excited to reach this agreement with Covidien, which further advances the company’s mission to alleviate pain, restore health and extend life for patients around the world. "This acquisition will allow Medtronic to reach more patients, in more ways and in more places. Our expertise and portfolio of services will allow us to serve our customers more efficiently and better address the demands of the current healthcare marketplace, Ishrak added. "We also look forward to welcoming the Covidien team to Medtronic and working together to improve healthcare outcomes globally." Following the completion of the acquisition, the businesses of Medtronic and Covidien will be combined under a new entity to be called Medtronic plc. Perella Weinberg Partners served as financial advisor to Medtronic, while Cleary Gottlieb Steen & Hamilton and A & L Goodbody as its legal advisors. Goldman, Sachs acted as financial advisor to Covidien, while Wachtell, Lipton, Rosen & Katz and Arthur Cox as its legal advisors. Bank of America Merrill Lynch provided committed financing for the transaction. 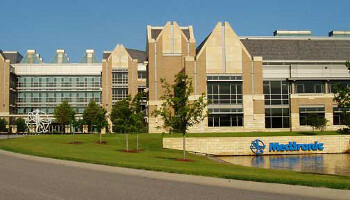 Image: Medtronic’s world headquarters in Minneapolis, US. Photo: Courtesy of Medtronic Inc.